Series 2000 Material Lifts from Kerrick Industrial Equipment are designed for lifting heavy material such as steel beams and/or continuous work. Series 2000 Material Lifts have a compact construction with a galvanised steel finish that features a strong mast design and a superior cabling system. The shorter mast sections of the Series 2000 material lifts facilitate simple passage through doorways and fit easily into vehicles with limited storage space. 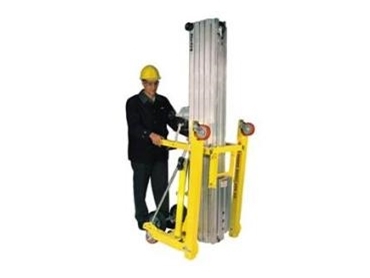 Compact storage of Series 2000 material lifts is further simplified by a leg lock mechanism that releases with the push of a button and locks in the stored position, and leg rollers that can be lifted out or wheeled around. Series 2000 Material Lifts also feature reversible forks that can be removed by plunger pins and repositioned for added height.